Some things in politics are so utterly predictable that we can guess what our politicians are going to say with a high degree of certainty before they open their mouths. How many times have we heard Labour politicians trot out their “cost of living crisis” mantra over the last couple of years every time there has been a negative piece of economic data released? And who was even remotely surprised when Nigel Farage came out with his “We’re going to have to be a lot braver and a lot more courageous in standing up for our Judæo-Christian culture” comment following the Islamist atrocities in Paris? One of the main reasons for Farage’s appeal away from the Westminster bubble is that he is willing to say what a large proportion of the public is thinking, but would rather not acknowledge openly for fear of being accused of bigotry or hatred. Do many people feel uneasy about levels of immigration and the way multiculturalism is changing our society and culture? Yes they do. Do they like the sound of Sharia courts operating in this country? No they don’t, even if they haven’t a clue how they actually work. And how many people believe that the authorities have turned a blind eye to FGM and the racial aspect of sexual grooming in Rotherham and elsewhere, because they are not willing to address the religious and ethnic dimensions of these wicked practices? 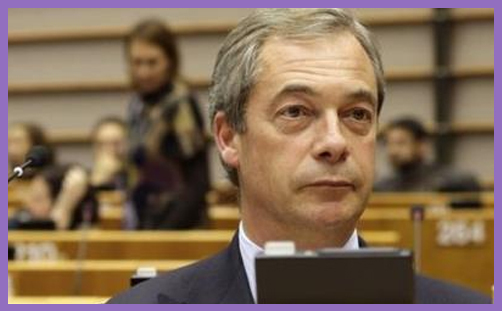 The problem is that Farage – speaking as a true politician – likes to take the worst examples to make his point, and by doing so leaves us more fearful of the overarching situation than we rationally should be in order to win us over and gain our vote. But this doesn’t mean that we’re being fed a pack of lies; it is (mostly) truth – from a certain point of view. This is the case when it comes to the future of our country and the threat to our Judæo-Christian heritage. It’s impossible to disagree with the fact that Britain is rapidly becoming less Christian and more secular. The increase in those following the Muslim faith is also surging. The last census in 2011 found that 59 per cent (33.2 million) of respondents in England and Wales described themselves as Christian. This was down from 72 per cent in 2001. On the other hand, those of ‘no religion’ now account for 25 per cent (14.1 million), compared to 15 per cent in 2001. Practising Muslims are expected to outnumber practising Roman Catholics within the next 10 years, and according to current trends, attendances at mosques will outnumber those at churches sometime in the next 40 years. These are monumental shifts in a generation, and the impact on our culture is already manifest and profound. Is it right for Nigel Farage, David Cameron and Eric Pickles to be claiming that Britain is still a Christian country and that our Judæo-Christian heritage needs defending against a combined multicultural, Islamic and secular onslaught? It is so important when considering this question that we separate current religious practice (or lack of it) from the way religion has impacted and formed our national make-up and identity. To most modern Westerners, religion is the very antithesis of tolerance, a belief for which they can cite many persuasive historical examples. But those examples also make the opposing argument.. (P)ost-Reformation Christians were forced, by innumerable examples of intolerance and its effect on society, to develop a robust defence of toleration. That defence was based on principles concerning the legitimacy and proper extent of adiaphora, ‘things indifferent’, the acceptable boundary between temporal and spiritual jurisdictions, and the appropriate function of law in adjudicating between different scriptural interpretations. And all of these interpretations were rooted ultimately, and sometimes explicitly in biblical teaching. This is not to claim that toleration is not possible beyond biblical bounds. That is obviously not the case. It is, however, to suggest that toleration was hard won and remains a far from self-evident virtue. The confusion and consternation that dog current debates about toleration, reflect a little of our historical amnesia concerning its origins. Much of our lives are infused with Christian values and heritage irrespective of our individual beliefs. The thing is that it is so ingrained in our national identity that much of it is taken for granted – Christian values and morals make up our Britishness far more than most of us realise. Even Humanism derives much of its morality from Christianity, whether its proponents choose to acknowledge it or not. Some humanists and secularists might like to believe that this country would probably have turned out pretty much the same without the Christian Faith flowing through it over the years, but you only have to look to other countries where this has not been the case to see that their thinking is both arrogant and naive. Humanism, as set out in the 2002 Amsterdam Declaration, can easily be described as both biblical and Christian in the majority of its fundamentals. Islam, however, is a very different beast. Islam, as a political as well as religious entity, provides a very different worldview and presents a not entirely welcome set of challenges and demands to the Western mindset. With its growth in Britain, we are having to ask some very difficult questions about how or if these conflicting paradigms can harmoniously coexist. When Nigel Farage talks of the need to defend and protect our ‘Judæo-Christian’ heritage, what he is really saying is that if the Christian heart of our national identity is removed, our Britishness will become unrecognisable. The consequences would be a massive social upheaval and the political fragmentation of so much that has been established over the centuries. For this to happen over a comparatively short period would destabilise our lives and communities significantly. The vast majority of British people don’t want to go through such unsettling change, which explains much of the appeal of Ukip as it offers a future that looks back to and grasps hold of the beliefs and philosophy that have defined Britain for so long. It may be reactionary, but the alternatives that seek to compete with our Christian heritage and impose themselves on us are too alien and, more critically, offer no apparent advantages to be widely accepted. Increasing cultural diversity has brought many benefits, but if our nation is to retain a sense of unity and identity, then we need common bonds. And it is the centuries of socio-political formation with Christianity at the root which provides the strongest bond of all. That is why Nigel Farage is right to call for its defence, even if his language and methods may be questionable. Without Christianity at the foundation and core, Britain will be drawn into an identity crisis from which it may never recover.